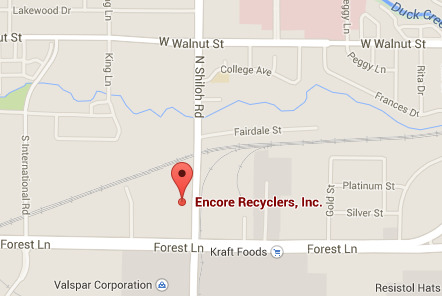 What does Encore Recyclers recycle? We recycle all common metal-based products, such as copper, brass, stainless, aluminum cans, insulated copper wire, aluminum alloys, nickel and other exotic metals. We also recycle various electronics equipment, including computers, mobile phones, DVD players, VCR’s, iPods and gaming consoles. What is the current price for copper (or steel or any other metal)? Prices vary with the market. Give us a call for the latest pricing and talk directly to one of our friendly, experienced buyers: 972-272-5845. Do you offer pickup services? Pickup service is available depending on the size of the load and the location of the pickup. Please call us at 972-272-5845 to arrange pickup services. Simply put, ferrous metals and alloys contain iron; non-ferrous materials do not. It may not be easy to tell when just looking at a random piece of metal, but there are several other factors that differentiate the two. Ferrous metals include carbon steel, stainless steel, mild steel, cast iron, and wrought iron. These metals are used for strength and durability, as in skyscrapers, bridges, housing construction, industrial containers, large-scale piping, automobiles, train rails, household tools and hardware, and cooking knives. Most ferrous metals and alloys (with the exception of wrought iron) will eventually rust when exposed to the elements. Their most distinctive characteristic is that they are also magnetic. Non-ferrous metals include aluminum, brass, copper, nickel, tin, lead, and zinc, as well as precious metals like gold and silver. They are wildly different from each other, but they do have in common that they are usually lighter in weight and more malleable than ferrous metals. Most significantly, perhaps, they are not magnetic. Recycling is one of the most significant things we can do to help our environment. Using recycled products instead of virgin materials during manufacturing dramatically reduces pollution and carbon emissions, reduces energy and water consumption, and frees up much-needed space from our landfills. What will happen if we don't recycle? Apart from the devastating impacts associated with increased carbon emissions, without recycling, there is a very real danger that important commodities will be lost forever. Metals and many other materials can be recycled and used again indefinitely, meaning we protect and preserve some of nature’s finite resources. What is Encore Recyclers' contribution as a recycling facility? Encore Recyclers recycles millions of tons of steel, aluminium, copper, insulated wire, lead and e-waste a year globally. Add to that the bicycles, vending machines, mobile phones, aluminium cans and any other materials we throw out every day, and it is easy to understand the contribution Encore Recyclers is making to the sustainability of our planet. What is Encore Recyclers' commitment to recycling? At Encore Recyclers, we intend to “keep doing well by doing good”. We started as a small recycling company over 20 years ago, we have just completed an expansion project that has now trippled the size of our facility to better serve our community and our surrounding area. We are committed to investing in new technologies and market development. We are good at what we do and intend to keep doing it for a very long time to come! For Encore Recyclers, sourcing, reclaiming, managing and marketing your scrap materials is just the beginning. Our goal is to create solutions for our customers that not only take problems off their desks and eliminate costs but create new sources of revenue. Whether your business uses scrap metal or electronics materials in its manufacturing process, Encore Recyclers will create a custom solution just for you! Whether you're selling metal on an industrial, commercial, or individual scale, our friendly and knowledgeable buyers are ready to help. Contact us and get an estimate right away. Whether you're selling metal on an industrial, commercial, or individual scale, our friendly and knowledgeable buyers are ready to help. Contact us and get an estimate right away.